Monday morning, October 21,while the Moon is in late Taurus and V/C, Mercury comes to a standstill and reverts its direction. Till November 10, while passing between Sun and Earth, the messenger of the gods appears to move backwards. Retreating Mercury doesn't have the best reputation. Judgments might be compromised, important facets hidden. Key features might get overlooked, situations might change so drastically that they will beg for altogether fresh assessment. Mercury is retracing its steps, hence we're advised to do exactly the same. This is the time to tie up loose ends, return to what's been left unfinished, and resolve issues which at a time were not high on our agenda. These coming three weeks ask us to do our homework and regroup our energies. According to the I Ching synchronization with the zodiac, Mercury at present is in hexagram 1, the Creative. Ground breaking insights are descending. Brilliant ideas and novel approaches pop into our minds. Hexagram 1 represents divine inspiration, initiative and persistence. A dynamo of potent energy connects us with source. In intense flashes and lightning bolts new dreams and visions are taking shape. Scales may fall from our eyes as unrelated facts and events reveal their common denominator. A particular highlight is Mercury's alignment with Saturn. Because Mercury performs a loop, it meets Saturn three times. On their first meeting of October 8, senate women made the breakthrough, eventually bringing the US government shutdown to an end. In my daily forecast I predicted that a solution present itself. Pluto, the ruler of Scorpio is in Capricorn. And Saturn, the ruler of Capricorn is in Scorpio. These far planets are in mutual reception, they are in each other's sign, enhancing and supporting one another. Their common theme is reconfiguring power structures. Their combined energy might topple schemes. The way how power and money are handled and distributed might get redefined over the course of the coming two years. Mercury is teaming up with Saturn; this is the time to be sincere, clear and concise. This can mean hard work, dedication is paramount. We might have to dig to the very bottom of the pile, turning each and every stone. But be assured, it's absolutely worth the effort, although we won't be able to see immediate results. It was a bit disappointing to see comet ISON braking apart on November 28, during its close encounter with the Sun. I didn't mention at a time , but I had my suspicions: would ISON going to survive grazing so close to the Solar furnace? As you might remember, the degree the comet emerged from deep space, the 20th degree of Cancer, is presently highlighted by transiting Jupiter. At the same time though, and that's the story I didn't write about, the power axis of the Moon, the symmetry line of the Lunar orbit, the 'Black Moon' has been charging up that very same degree. If it had been Jupiter alone, a spectacular display would have been out of question. However, as short lived as ISON was, it provided for a spectacle, jumping up 60 times in brightness over its last ten days of existence. And its dive into the Sun's corona was nothing short of dramatic, accompanied by high suspension. In fact, comet ISON has set new standards. No other comet ever has been observed dying, and then being reborn! Passing through hellfire, less than one million miles above the Sun's surface, ISON became invisible. Stereo spacecrafts' high-resolution cameras weren't able to see it anymore, it seemed to have disintegrated completely. Hours later however, the surprise was great. Shooting away from the Sun, defeating our star's massive gravitational field, ISON's coma re-emerged. Like Phoenix, the magical bird, comet ISON rose from the dead, reborn out of its ashes. It's true, the excitement turned out to be short lived. ISON became ghost like soon thereafter, and by December 1, it had faded away completely. So, what role does the Black Moon play in this drama? The mystery hides in the geometry of the Moon's egg-shaped path. The two spots where Earth's satellite is at closest and farthest distance from us facilitate extremes. It's a fact, anything that's out of balance is potentially dangerous and threatening. When something escalates everything becomes possible, we don't know what's coming next. Any moment the situation could get out of hand, extremes could even become points of no return. So, when the Moon comes to its closest approach we might get rolled over, overwhelmed, gulped up. And at the other end of its journey, when the Moon is at greatest distance, another stressful situation is created, propelling fears that our companion might escape, triggering spells of potential loss, alienation and desolation. The Moon is of paramount importance for life on Earth. In Sanskrit which is one of the oldest languages, the Moon is called 'Ma', Mother. The Moon mediates between Earth and the cosmos, it's the connecting link. Similar to a power substation the Moon modulates Solar energy, transforming it to biologically digestible levels. Its gravitational pull causes oceans to bulge which generates the tides, setting a complex dynamo in motion. And it's not just the vast oceans which are effected, every cell is a mini ocean and therefore moved by the Moon's presence. The Black Moon's presence made the unfolding drama predictable. And it caused all the great dreams of a spectacular display to collapse. However, it also spectacularly demonstrated that the unexpected is always present. Resurrection and rebirth are not just empty promises, they're a reality. Being a cosmic messenger, comet ISON has delivered a most precious message: that the fable of the magic bird Phoenix is real and alive. 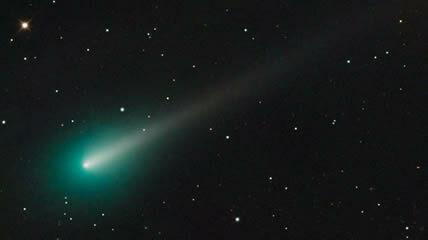 C/2012 S1 is a sungrazing comet discovered on September 21, 2012, by Vitali Nevski and Artyom Novichonok. The discovery was made using the 16 in reflector of the International Scientific Optical Network (ISON) in Majdanak, Russia and the automated asteroid-discovery program CoLiTec. 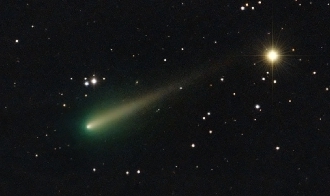 Comet ISON is plunging towards the Sun, diving in from steep North. Should it survive its extremely close encounter with our star on November 28, it will get sling shot by the Sun's strong gravitational field, catapulted right back to where it came from - most likely treating inhabitants of Earth's Northern hemisphere with a most spectacular show which could last for months. Calculations based on its highly parabolic path indicate that it should miss the Sun by a mere one million miles, equaling about five times the Moon-Earth distance. However at this point nobody knows if ISON will survive its close encounter. It might as well break apart, or dive right into the Sun's fiery body. It has proven very difficult to predict the display of a comet. Thus scientists are cautious in getting the public too excited. However from an astrological perspective I'm convinced that ISON will turn out most spectacular. How do I come to this conclusion? Well, ISON's entryway from interstellar space is the 20th degree of Cancer. ISON's diving angle is rare, it's pretty much vertical. For thousands of years ISON has been in that very same spot, slowly edging closer to the Sun, like a moth attracted by light. It's one of these amazing cosmic synchronicities that Jupiter would conclude its yearly culmination exactly in this degree. Jupiter is building the bridge, shouting "look what I've come across!" Jupiter is the biggest planet, it owns over 60% of the Solar system's angular momentum. It's the angular momentum which facilitates changes. Linear momentum is not affected by anything, it manifests consistency and predictability. Every celestial object (us included) is subject to both these forces. Linear momentum is the product of mass and speed. The heavier I am, the faster I move, the greater is my linear momentum. It defines my path, telling the story of where I'm coming from and where I'm going to, it's all about me. Angular momentum is way more complex, it takes the surrounding universe into consideration. The atoms of the spinning top surrender to their shared center. And the satellite moves on an elliptical path because it's in a dynamic relationship with its parent. Jupiter is the big mover, the king of the planets, intensely interactive - bending corners, taking us on wild rides into the unknown. And as if it were not enough, Jupiter is so massive that it even causes the Sun to wobble, likely being the underlying cause of the Sun's 11-year sunspot cycle. September 1: ISON came within five degrees of Mars, starting to team up with the Red planet. October 1: ISON crossed Mars' orbit; since then it's closer to the Sun than Mars (NASA applet simulating ISON's orbit). October 15: within nine hours, Mars and ISON entered Virgo. It was on this day that the US government crisis didn't get resolved but postponed to January 15, 2014. October 16: from our point of view, comet ISON passes planet Mars. Still strongly teamed up, ISON gradually is increasing its lead, leaving the 5-degree orb with Mars by October 29. Comet ISON is such a new addition to the Solar system, we yet have to discover its intrinsic energy, character and personality. However, there's a way to peek behind curtains! We can look at its discovery chart, and at the projected moment of its closest approach to the Sun (perihelion chart). Another big clue is the degree from where it emerged, the 20th degree of Cancer. Hexagram 53, Gradualness, is in this position. The guiding mantra says: ``Be gradual like a woman planning to marry. God fortune comes by firmly keeping to the right way.`` This seems to be a great omen for a comet who desires nothing more than to meet the star it got attracted to many eons ago. Overall, the Virgo influence that began on October 15, changed the tone. In contrast to Leo's nature which can be somewhat more self-centered and boastful, Virgo is humble and ready to serve. Mars will be in this changeable earth sign into the first week of December, adding a moderating and methodical note to all our action and undertakings. The Sun is in the last and critical degree of Libra. The Gemini Moon generates excitement. Interactions are easy and stimulating. However, there's some urgency in the air. Remember to take a deep breath once every so often and enjoy the beauty of existence. Yellow is the color of the South, suggesting that this is a day of flowering and accomplishment. Shortly after midnight, while the Moon is V/C, the Sun enters the sign of mysterious Scorpio. Mercury's retrograde phase, a well as the thirty days of Scorpio are 'born' under the right-brain dominant energy of a void Moon. We just entered the innermost sanctum of this Water Snake year. Whatever your life's circumstances, take a moment to attune to what is. Life is such a tremendous gift. Acknowledge, you were given this life without asking for it. Gratefulness is the master key, not only does it open any door, it can take down entire walls. Wednesday night, at 9:36 p.m. the Moon entered Cancer. This Resonant Wizard is receptive, picking up all kinds of frequencies and emanations. There's a certain transparency. What normally is hidden is accessible. When veils are so thin it becomes very important to simply watch and absorb, silently standing by, as aloof as one wouldn't be part of this world. At 2:30 p.m. the Moon meets expansive Jupiter, initiating another void-of-course phase. Waves can be pretty high and emotions rather intense. Clarity and insight arise from confrontations, storms are clearing the air. Enjoy the wild ride, and please don't take anything personally! We are agents of transformation, and so are all the beings around us. The Moon enters Leo at 10:11 a.m. Another day of exuberant emotions. The Solar Warrior applies intelligence and discernment, treading carefully. In order to come to know one's inner composure and strength one has to stand alone and allow being all by oneself. Eb, the Human, knows the law of duality, that everything comes in pairs of polar opposites. Don't fall into the trap of choosing one side and refuse the other. This Leo Moon could be in for some drama. Change can happen very fast on Caban days. Everything is in motion, one might get shaken thoroughly. There's this tiny voice inside of us which knows exactly what's the right choice or action. This is our intuition, and it's always speaking up in the Now. If we fail to listen the message won't be played again.